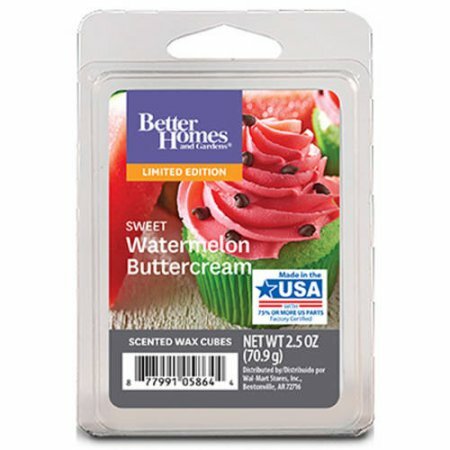 Sweet Watermelon Buttercream is a limited addition scent from Better Homes. I’m pretty sure it came out last year (or maybe even the year before that) but it’s back again so it must be a good seller. I’ve smelled watermelon blended with birthday cake before and it actually smells really good. So, I had high hopes these melts would have the same vibe. It was worth a shot. The flavorful blend of sweet watermelon, honeydew and strawberry leaf gives way to a delicious heart of whipped butter cream and sugared peony. That sounds beyond fresh and delicious. The wax – a lovely watermelon red matching the fragrance. Mmmm!! Smelling the wax, it smelled like sweet and creamy watermelon with tart honeydew as well. 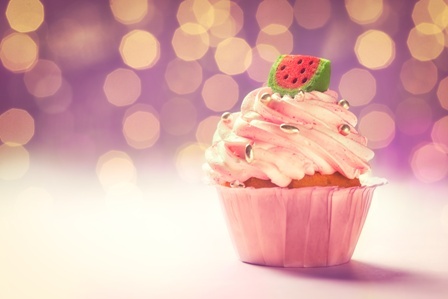 Strawberry and whipped butter cream? Oh yes please!! My mouth was watering! I used the entire clamshell pack (3 cubes each) in two electric melters in my great room. Once melting, it took roughly 10 minutes before the scent was moving through my home and oh my goodness… it was YUMMY!!! The entire upper level of my home smelled like a creamy watermelon. It wasn’t really cake or bakery but more of a sweet watermelon (which dominated) blended with hints of creamy vanilla. If you love melon scents, you will love this one. I enjoyed this one a lot. Strength for Sweet Watermelon Buttercream – I would rate these melts a 10 out of 10 in any size room. SUPER strong scent. LOVED!! I’m going back for more. I really loved it. Go smell this one next time you’re at Walmart… it’s a keeper!